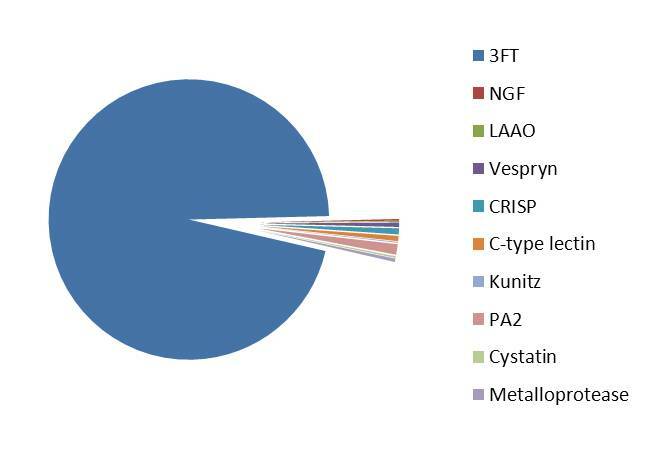 Figure 1: Composition of N. atra venom, studied at the transcriptomic level. This venom contains the following families: 3FT (snake three-finger toxin ), NGF (NGF-beta ), LAAO (flavin monoamine oxidase (L-amino-acid oxidase) ), ohanin/vespryn , CRISP, lectin (true venom lectin ), kunitz (venom Kunitz-type ), PA2 (phospholipase A2 ), cystatin, metalloproteinase (venom metalloproteinase ) (Jiang et al., 2011 ). Cathelicidin, natriuretic peptide, and peptidase S1 (serine protease) have not been observed in this study, but these proteins have been described in this venom (Zhao et al., 2008, Zhan et al., 2011, and Jin et al., 2007 ). Lethal dose LD(50) is 0.29 mg/kg when subcutaneously injected (Jiang et al., 2011 ).